Wolfgang Amadeus Mozart wrote most of his music to advance his career. He composed his Mass in C minor to build relationships. The composer who had recently married wrote his Mass in C minor showcase his wife as a singer and to mend fences with his father, who did not approve of the match. It seems not to have worked. But what didn’t work in 18th century Salzburg definitely did work in 21st century Grand Rapids. Music Director Marcelo Lehninger led the Grand Rapids Symphony and Symphony Chorus in an inspiring performance of Mozart’s “Great” Mass in C minor on Friday, Nov. 16 in DeVos Performance Hall. It’s safe to say the concert, which was repeated Saturday, Nov. 17, deepened the relationship between the Grand Rapids Symphony and its audience. The fourth concert in the 2018-19 Richard and Helen DeVos Classical series also included Schubert’s “Unfinished” Symphony No. 8 and Charles Ives’ The Unanswered Question, resulting in an evening of music that was “unfinished, unanswered and incomplete.” But satisfying nonetheless. Mozart’s Mass in C minor is an odd sort of work because Mozart never completed it. But the Grand Rapids Symphony’s presentation of what he did compose was an unqualified success. The “Gloria” was splendid with a big, but tasteful, explosion of sound. The “Qui Tollis” was dramatic and heartfelt with precise rhythms. The last time the Grand Rapids Symphony performed the Mass in C minor, some 14 years ago, the orchestra enlisted the another choir to participate. 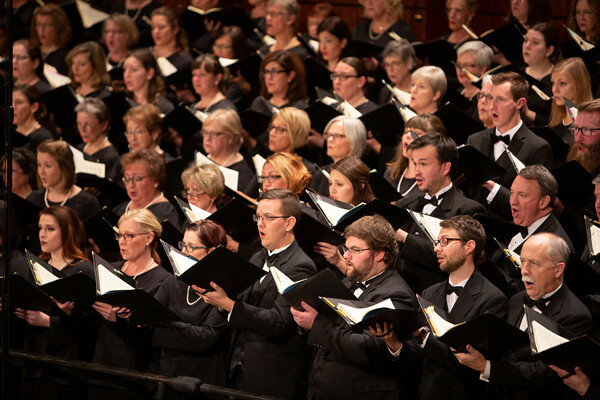 For this performance, the Grand Rapids Symphony Chorus was more than enough. The stirring double chorus of the “Sanctus” was full and exciting. Mozart did write this to show off his wife, Constanze, so any performance makes the soprano the star. Martha Guth delivered a beautiful performance of “Et Incarnatus est,” aided by the woodwinds of the Grand Rapids Symphony, a supremely challenging piece to perform. Mezzo soprano Susan Platts has made several performances with the Grand Rapids Symphony, and it’s immediately clear why she’s invited back. Her performance of “Laudamus Te” was golden. Her tone, her phrasing, her melodic lines all seem so perfect, it’s hard to imagine her performance could be improve upon. Mozart asks much less of the tenor and bass soloists. Once again, if only he had finished the piece. But tenor John Matthew Myers and bass-baritone Dashon Burton both were delightful on the concluding “Benedictus.” Myers performed with the Grand Rapids Symphony last May, and Burton returns in March for the 2019 Grand Rapids Bach Festival. You won’t want to miss hearing more from him. Schubert’s Symphony No. 8, which was discovered in a locked trunk several years after his death, arguably is the first symphony of the Romantic era in music. Previously, the symphonies of Haydn, Mozart and Beethoven began with an opening movement brimming with confidence. Schubert’s B minor Symphony emerges with false confidence masking uncertainty beneath the surface that entices the listener. The “Unfinished” Symphony, as became known, because only the first two movements were discovered in that locked trunk, is even more of a conundrum than the Mass in C minor. Mozart probably intended to finish it. He just never got to it before his death. A bit of a sketch for the scherzo, the third movement, exists, but Schubert went no farther. He may simply have painted himself into a corner and didn’t know how to get out. Departing from customary practice, Schubert composed the first two movements in triple meter. Typically, the third movement of a symphony is in triple meter. Possibly Schubert couldn’t decide whether to follow or break with tradition and simply set it aside. Or maybe he did compose two more movements that were misplaced. So far, no one knows. What we do know is that half a symphony by Schubert is better than no symphony at all. Lehninger skillfully led a performance of supple melodies, edgy rhythms and forceful harmonic transitions. In short, beauty encased in tension. Such was the impact of the opening movement that Friday’s audience applauded afterward. Purists may wish to discourage it, but when it’s an honest expression of an audience’s feelings, it’s more of a pleasure than a distraction. The second movement was full of charm, subtle and nuanced. Schubert’s Eighth Symphony today is regarded as complete in its own way. But one can’t help but wonder what might have been. American composer Charles Ives is a one-of-a-kind. No one wrote music like him before, and no one really has since. The iconoclast Yankee was born and bred in the 19th century but he composed music that audiences wouldn’t understand or embrace for another century. “The Unanswered Question” for brass, woodwinds and strings is a work that makes perfect sense if you know the roadmap first. Set against a soothing, mesmerizing pad of strings, the brass ask a difficult question that jars the senses with its dissonance. Woodwinds offer an answer, which the brass reject and ask a probing question again. Winds reply once more. This goes back and forth for a while until the brass pose once more the ultimate question of life, the universe and everything. This time, it’s answered by silence. It’s a piece that makes you think. Lehninger upped the ante by performing it entirely offstage. The audience arrived to a stage empty of musicians. The concert began with the lights fading to black followed by the eerie sound of strings emerging from the distance. Though it took a few moments for the audience to realize the music had begun, the beguiling performance in darkness certainly heightened the experience.